Valparaiso University professor, Alfred H Meyer, was an ardent proponent of sequent occupance. Sequent occupance has been defined as the notion that successive societies leave their cultural imprints on a place each contributing to the cumulative cultural landscape. It is also referred to as Human or Cultural Geography. Using the history of the Kankakee Marsh it is easy to see how the impact of succeeding cultural groups led to eventual draining and channelization of the marsh. The more I’ve researched sequent occupance the more sense Meyer’s 1935 “The Kankakee Marsh of Northern Indiana and Illinois” makes to me. Meyer breaks down the succession of cultural groups into a logical, easy to understand, progression to what exists today— a 97 mile ditch where before existed a half a million acre ecological paradise for man, fin, fowl and fur. So how did we get where we are and where do we go in the future? The Native American is the first group identified by Meyer. Meyer calls this the “Pottawatomie’s Kankakee” (?-1840). This group had the least impact on the Kankakee Marsh. They settled mainly on the higher marsh areas and sand islands. The Native American migrated seasonally between the marsh and the dunes of Lake Michigan. Artifacts have been discovered that reach back over 11,000 years. The next cultural group was the pioneer hunter and farmer. This group too had little impact on the marsh. However the pioneer farmers did begin some small scale ditching and draining of their individual homesteads. Technology had not yet advanced to economical largescale draining. The Erie Canal finished in 1825 did show some promise for future “reclamation.” Today it is difficult for us to understand that the view of draining the marsh in the 19th century was seen as land reclamation. Today many refer to it as the destruction of an ecological wonderland. 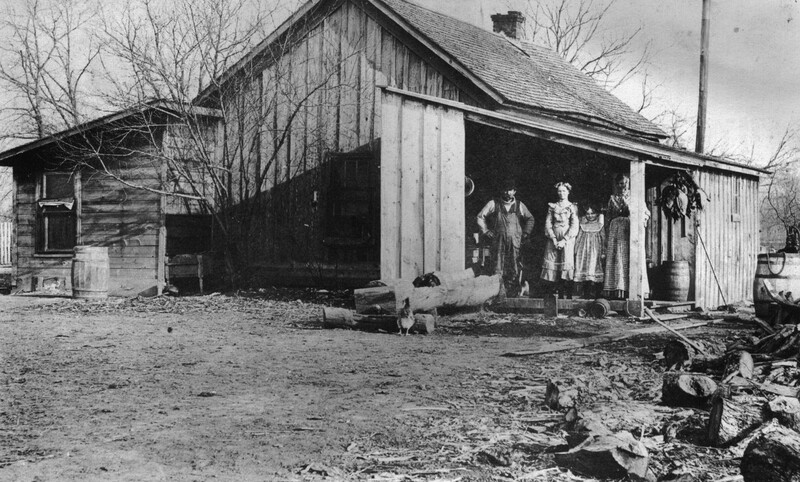 The third stage of “Sequent Occupance” was the Rancher’s and Recreationist’s Kankakee (1880-1910). During this period cattle ranches began to have a large impact on the Kankakee. With the proximity with the huge meat packing industry in Chicago the Kankakee Marsh was a logical choice to graze cattle on the abundance of marsh hay the marsh offered. Nelson Morris’s 23,000 acre ranch was the largest, but many smaller ranches thrived along the Kankakee. The runoff from the ranches added dramatically to pollution of the river, but at that time environmental concerns were nonexistent. However, the ditching and draining of ranch properties contributed to the eventual demise of the marsh. The great influx of sportsmen and construction of clubhouses simply made awareness of the beauty and bounty this “Everglades of the North” offered. It surprises me that these “Rich and Famous” political and business leaders did not rise up in mass and prevent the draining of their sportsmen’s haven. Many of these clubs held leases of huge amounts of marsh property, but with the draining of the marsh they lost all to the dredge shovel. Meyer identified the Reclamationist’s and the Resorter’s Kankakee (1910-present) as the final cultural group that influenced the future landscape of the Kankakee. This period saw many of the hunt clubs being sold to private ownership. Numerous clubs became resorts where anyone, for the price of a train ticket, could enjoy the bounty of the Kankakee Marsh. My next column will tell of Meyer’s plan for Kankakee River restoration.